The BioHealth Capital Region has unmatched biohealth assets from iconic federal institutions, world-class universities, top-notch healthcare facilities, and global and emerging bioscience companies. However, we have yet to fully realize the return on investment from these assets. This is largely due to the lack of a cohesive strategy in moving ideas from labs to the market. While other regions with far less assets have proactively addressed this opportunity by creating innovation-driven economic development organizations and initiatives. It is time central Maryland started to close this gap, and it is BioHealth Innovation’s mission to complete. - Ensure an adequate supply of experienced biohealth entrepreneurs and workers. Within five years, BioHealth Innovation (BHI) will be a catalyst to transform the BioHealth Capital Region into a leading global BioHealth entrepreneurial and commercialization region. BioHealth Innovation connects market relevant research assets to appropriate funding, management and global markets to facilitate the development of commercially viable biohealth products and companies. 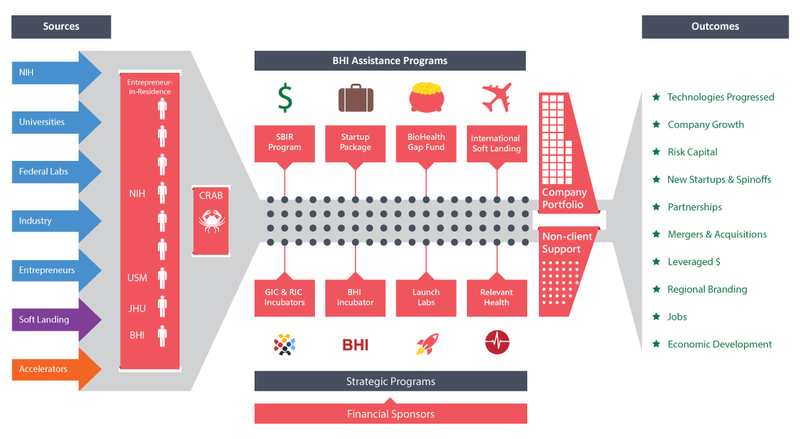 BHI will accomplish its mission by building an entrepreneurial ecosystem, working directly with federal and academic technology transfer offices, making various types of risk capital readily available to promising biohealth startups, strengthening and connecting the local supply of industry talent, developing a regional brand and reputation, and advocating for improved business and regulatory conditions in the industry.